Got a sun spider infestation? Don't worry, this spider (scorpion) is the easiest to control and remove. Part 5 of our spider control series. It is very unlikely you will need the assistance of a professional pest control service in order to remove this spider. And the reason is because this spider, which is also known as "wind scorpion," is your ally and has no intension in hurting you. So unless you handle them incorrectly, they are most likely helping your pest control than increasing it. The wind scorpion is a beneficial spider to have around, though not inside your home. They feed on all kinds of other pests, such as insects, spiders, critters, lizards, and whatever others they can get a hold of. If you get the management under control they can become a good pest to have around. So don't be scared by their appearances, they are quite harmless. A female wind scorpion will dig a burrow and lay around 50 eggs which she guards with her life until the young are done hatching. They'll grow up and move around in search for food. They can usually be seen on pathways and roads during the day, but they are most active at night. They like to hide in cool and dark places, under rocks, inside homes and other buildings and underneath anywhere they can get cool. Characteristics: grow to be 1-3 inches long, yellowish or tan in color Wind scorpions do not spin webs to catch their prey; instead, they have large leg-like pedipalps on each side of the jaw, making them look like they have 5 sets of legs (instead of 4). 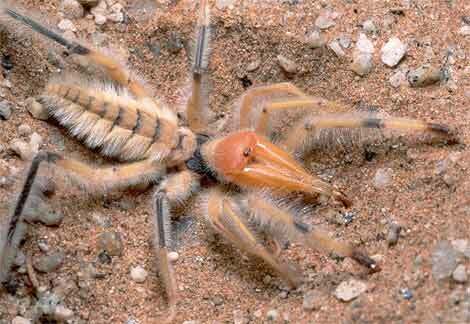 They spend most of their time underground and are most active in the desert where it is hot and arid. You are most likely to run into sun spiders at night inside your home. They are looking for their late night snack!!! If you see them don't be afraid, they are incapable of causing any serious harm to people, although you would never guess it by their looks. The technical reason for this is due to the fact that they lack poison glands. But if you handle them, they will bite. It is unlikely that you will see a sun spiders infestation in your home, but if you do, visit our scorpion control page here for instructions on how to get rid of them. simply pick them up and release them a good distance from your property. To do this you need a jar and a piece of paper. Isolate the sun spider, place the jar over it, slip the piece of paper underneath the jar to prevent it from escaping, then seal it.